"Welcome to the extraordinary odyssey of a confused young man, led by wacky doctors through a labyrinth of wildly theatricalized versions of major life crises and temptations - wealth, sensuality, power, romance, lost innocence, and death. 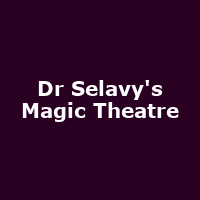 Presided over by the enigmatic Dr. Selavy (or C'est La Vie, if you like), himself an illusion created by master trickster Marcel Duchamp, this outrageous journey leads our hero in an ironic dance through an eccentric fun house of extravagant awakenings to a climax of self-knowledge and acceptance. To the strains of an eminently hummable and upbeat score, this offbeat piece provides an adventurous departure from the traditional expectations of musical theatre."